Angeline's Aromatics is the alchemy shop in Solitude. The proprietor, Angeline Morrard, trades potions, food, ingredients, and books, and has 500 base gold. If anything happens to Angeline, her niece, Vivienne Onis, runs the store in her place. The entrance leads directly into the shop with the counter across in front of you. On the counter are three common books, a couple of open crates displaying various merchandise, with a garlic braid, two bunches of dried elves ears and a bunch of dried frost mirriam hanging above the counter against the west wall (which is all merchandise). Above the counter at the other end are two further garlic braids and two more bunches of dried elves ears (which are also merchandise). There are also a petty and lesser soul gem for sale on a ledge and stand. Against the south wall, to the left of the entrance is a low table holding three more common books and some more merchandise, with a small non-respawning wardrobe containing fine clothes next to it with an open crate on top. There is then a narrow table with two more open crates, one on the narrow table and the other on the floor in front of it, beside two black kettles. These all contain merchandise for sale. To the right of the entrance is a wooden bench beside a set of shelves with more displayed merchandise and a pair of boots. North of these is a set of double doors leading to the residence, with an alcove to the east containing an alchemy lab and to the west access behind the counter. Against the north wall, behind the counter are four sets of shelves mainly holding various displayed merchandise, along a set of blue mage robes and an empty petty soul gem. Under the counter are more items that are sold. At the western end of the counter is another alcove with more merchandise displayed on a set of shelves and a cupboard. The door to the north leads to a dining area with a long wooden table with a chair and a wooden bench pulled up to it. It is laid for three people with two bottles of alto wine, a potion of regeneration, a bunch of tundra cotton, a loaf of bread, a goat cheese wheel, some salmon steak, some baked potatoes, and some seared slaughterfish. Against the south wall are two sets of shelves holding clutter. Against the east wall is a narrow table with a bowl of bread, a plate holding an eidar cheese wheel and a plate of red and green apples, with a wall shelf above holding a bottle of alto wine and two bottles of Nord mead. To the left is a cooking pot on a stand, while in the northeastern corner is a small non-respawning cupboard. Against the north wall is a bookcase holding eight common books, a flute, a drum and a potion of health. By the door, against the west wall is a wooden bench where you can often find Angeline Morrard sitting down. Climbing the stairs there is a large vase containing a snowberry bush half way up. At the top of the stairs is a landing with a small cupboard on the left holding a bottle of alto wine and three bottles of Honningbrew mead. Along the north wall is a wooden bench and a low table, and a door leading to Angeline Morrard's bedroom opposite. There are two more doors to the east, and around the corner against the south wall is a narrow table with a chaurus egg, a stone bowl containing a sprig of snowberries, a red, a blue mountain flower, a Hagraven feather, and a Hagraven claw on top. There are two wall shelves above, holding a potion of health, a potion of resist fire, a weak aversion to shock, a potion of minor healing, a copy of Pension of the Ancestor Moth, and a copy of The Firmament. Angeline's bedroom is a large bedroom with a wooden bench opposite a small non-respawning wardrobe containing fine clothes on either side as you enter. There is a four-posted double bed coming out of the south wall opposite, with a non-respawning end table on either side. On the right-hand one of these is a copy of The Amulet of Kings. Against the west wall is a table iron dagger, a bowl of bread, and a plate with a sliced Eidar cheese on it. A wall shelf above holds a bottle of alto wine. At the foot of the bed is an unlocked long chest containing random items. To the left of the bed are two wall shelves holding a potion of plentiful healing and a set of novice robes of illusion, as well as a sprig of lavender. There is a chair in the southeast corner with a non-respawning tall wardrobe to the left along the east wall. In the northeast corner are two bookcases, a wooden bench and a low table with a bunch of tundra cotton and two common books. The bookcases hold a set of blue mage robes, a bunch of elves ears, a sprig of snowberries, a weak poison and three more common books. The left-hand door on the east wall of the landing leads into Vivienne Onis' bedroom containing a single owned bed in the northeastern corner and a non-respawning end table to the right, as well as a small non-respawning wardrobe against the south wall holding a solution of strength, a potion of extreme stamina and a common book. Further to the right is a chair by a narrow table which is holding an iron dagger, a bowl of bread and a plate with a sliced Eidar cheese with a wall shelf above with two bottles of Nord mead and a bottle of alto wine on it. There is a tall non-respawning wardrobe and washbasin on a stand opposite, against the north wall. The right-hand door leads into a study of sorts with a wall shelf and two bookcases against the north wall. There is a potion of plentiful healing and a sprig of lavender on the wall shelf. On the bookshelf are eleven common books as well as copies of 2920, Sun's Dusk, v11 and 2920, Evening Star, v12. There is also an apprentice locked strongbox containing random items. Against the south wall is a large round wooden table and two chairs, with the business ledger on top. Descending the stairs to the cellar leads to a storage area with several food barrels around the cellar. Against the north wall is a cupboard holding a bowl of tomatoes, several pieces of cheese, a few loaves of bread, two sweetrolls, and a haunch of raw venison. Further to the right is an unlocked chest containing random items with a garlic braid, two bunches of dried elves ears and a bunch of dried frost mirriam all hanging from the ceiling above. To the east is a small unit with a bottle of Black-Briar mead and against the south wall is another non-respawning cupboard holding a potato, more loaves of bread and many more pieces of assorted cheese. Finally in the southwest corner is a long wooden table with a thistle branch, a bunch of tundra cotton, a nirnroot, some juniper berries, two leeks, a deathbell, some dried elves ears, a dragon's tongue, some wheat a loaf of bread and a plate with a red and two green apples on top. The following items are sitting out in the store, for example on the store counters. They can be purchased from the merchant, or else can be stolen. Only items players are likely to want to purchase are listed. Other items may also be present in the store, but they are not available for purchase. They respawn after ten days. 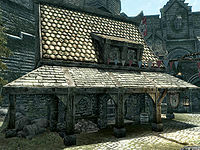 Most of the food, beverages, ingredients and potions not found in containers, with the exception of those that are hanging (dried elves ear, etc), the bottles of Honningbrew and Black-Briar mead, around the residence and shop are sold by Angeline not just the Displayed Merchandise. This page was last modified on 1 April 2017, at 23:54.